Tactical wargames suffer from the lack of a big picture. Yes, you took the town, hill, crossroads, airfield, whatever. You may have done so in grand style or by the skin of your teeth. Did it matter in the grand scheme of things? Usually we are left with only our imaginations to fill in the blanks. Panzer Grenadier is a game based on history (either that which occurred or that within alternate timelines). Designers like Jay Townsend, Mike Perryman, Philippe Leonard and others spend countless hours cobbling together orders of battle, understanding the terrain, the special weapons, the different capabilities of the armies and the results of actual engagements. From that information scenarios are born. Once those scenarios are drafted, the mix of pieces approximated, and draft maps created the product goes to development where we try to make sure that the scenarios are both interesting from a gaming perspective (both players have something to do and objectives that they can attain) and that they maintain a clear connection to the history of the situation. We wrap them up in a neat little bow and present them as playable gaming situations. We started down the path towards battle games with the enhanced narratives that were included in Blackshirt Division and the weird and wonderful Land Cruisers. When Dr. Bennighof asked Daniel and I to look over Kokoda Trail prior to rerelease we asked for a chance to give the scenarios a dusting off. By saying yes, he gave me a chance to read through the Australian Official Records of the Kokoda campaign and in so doing I gained a far greater understanding of the nature of the fighting but also the significance of the campaign to the overall war effort. It crossed over into global Allied strategy, American politics, cannibalism and the Commonwealth's propensity to use understatement in official communications. Certainly the scenarios demonstrated the desperate infantry fighting at close quarters in the green hell that is New Guinea but without an understanding of the context it was just a bunch of nasty assault and short range direct fire engagements. My research (and a trail of late fines from the local library) indicated that there actually was a lot riding on these tiny engagements and each player's performance could have an impact far beyond the elimination of a couple extra enemy platoons. Thus I worked up a way to string the scenarios together with some over-arching victory conditions to give players a 4-8 scenario “packet” that had some operational goal (for example, the Japanese penetrating to the airfield at Milne Bay). The result was the “battle game.” These linked scenarios provide the answer to “So What?” Perform well as the Australian player and MacArthur remains just a general, chase the Australians into Port Moresby and the Japanese may be able to get MacArthur elected President in 1944. As time has progressed the battle games are beginning to evolve. Some are tightly operational, like those in Invasion 1944, or the Spring 1944 battles in Broken Axis. Some have to do with national aspirations (Romania Mare in Broken Axis), some about racism (the solitaire campaign in the second edition of Go for Broke), some about the differential impact of economic warfare versus military action (River Fleets), and some about military doctrine (Maple Leaf and 1942: Defense of France). Our current project is the development of Korean War: Counter Attack and we find ourselves contending with the same issues that we started with back on Kokoda Campaign: MacArthur and the use of military leadership to advance ideological and political goals. 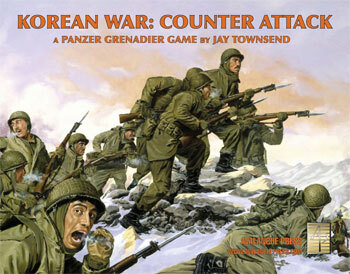 Although Korean War: Pusan Perimeter does not include battle games, the follow up game is ideally suited for their use. It was during this time that MacArthur's direction of the campaign in Korea was subtly (and in some cases overtly) designed to both eradicate the North Korean Army but also to advance specific political and strategic goals which were directly counter to the policy of the United States at the time. Clear military risks were taken to achieve non-military goals, including MacArthur's personal political aspirations. The portion of the war depicted in Korean War: Counter Attack is the shift from defense to offense on the Pusan Perimeter, the invasion at Inchon and the pursuit of the beaten North Korean Army through North Korea. Fail on the Pusan Perimeter as the UN player and there probably wouldn't even be an Inchon invasion. The Joint Chiefs were highly skeptical of the invasion (and those familiar with tidal charts will understand why) and actively opposed the invasion in favor of a more conventional breakout from the perimeter. Only once Eighth Army’s commander Gen. Walton Walker demonstrated that the perimeter was secure was a formal approval of the Inchon operation grudgingly given (aided by behind the scenes lobbying by the MacArthur's political allies). 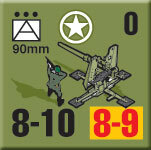 A battle game focused on the perimeter engagements is an obvious requirement. There were actually several engagements fought, many on the American sector of the perimeter and also on the South Korean (northern) sector. Each engagement gets its own battle game and there is a Campaign game (a meta-battle game of battle games) that ties them all together. As the UN player, one will need to accomplish certain goals over the full span of the perimeter battles in order to proceed with the Inchon invasion without penalty. Of course, fail on the perimeter and the invasion must be even more spectacular and successful. (The idea of foregoing the invasion, which would have been the most likely impact in the real world, will never be satisfying to those who look at all those additional scenarios in the booklet and wonder what would have been). As a result, the battle games for the invasion and pursuit will also have goals that are affected by the performance of both sides during the perimeter battles. How they affect what happens in Korean War: Intervention will need to wait until that product is ready to go! This type of treatment is only possible in a product like that of the Korean War series where an operation is relatively self-contained and where the impact of previous performance on future operations can be projected with some level of credibility. On the other hand, you can do what Panzer Grenadier players have always done. Sit down with the scenario book in your lap, a beverage in hand, and read through the booklet deciding which scenarios are most interesting to you (I write them down in Post It notes that I attach to the booklets for future reference, unless I just want to read through the book again). Now you can do so with the knowledge that; if you ever do wonder “So What?” the answers can be yours. Matt Ward, along with Daniel Rouleau, is the series developer for Panzer Grenadier games.